There’s a great Twitter account called We Want Plates where photos of food served in Wellington boots or on a shovel are shared. Yes I agree that food should be served on plates (and no-one wants bangers and mash in a wine glass) but I think that sometimes jars are acceptable too. Putting food in pots or jars such as Kilner jars is ideal for picnics as it’s self contained and can’t leak. No bake dessert pots like these can be made in individual jars or larger ones to share (who am I kidding, who shares pudding?) and pack easily into your cool bag. You can even make them in tiny portions in those little jam jars you get in hotels if you want to give them to kids. That’s why this is less of a recipe and more of a method- you simply adapt to your own needs. This no bake dessert is all about contrasts so a smooth chocolate spread is needed atop the crunch biscuit base. I’ve used this Sweet Freedom Choc Pot* because it’s lovely and smooth and unlike others it’s not actually full of sugar and palm oil. I had to restrain myself from just sticking my face in it!It is really rich, and has quite a strong flavour. I had to check the ingredients three times because I was convinced there was coffee in it giving it that richness, but no! The counterbalance to that chocolate layer is Opies Summer Fruit Compote*. It is full of the flavours of summer and is sweet but sharp, packed with red fruits. Fruit and chocolate is a match made in heaven so you have a pretty but easy dessert that you can whip up the night before or 10 minutes before you need it. A pretty dessert for days when you don't want to cook, these no bake dessert pots are perfect for picnics. Crush the biscuits into fine crumbs - either in a food processor or bash in a bag. Fill your clean serving jars 1/2 way with biscuits. Pat lightly so that the tops are smooth. Put the chocolate spread into an icing bag and snip off the end. It is the easiest way to get it in the jars. Add a layer of chocolate spread - approx. 1/4. Top will summer fruit compote. Close the lids and chill until ready to serve. The ratio for these pots should be roughly 1/2 biscuit, 1/4 chocolate spread, 1/4 fruit compote. Chill before serving or serve straight away if pushed for time. Do you have a go-to dessert or pudding which you make when it is too hot to bake? I am linking up with Tin and Thyme for her We Should Cocoa challenge. 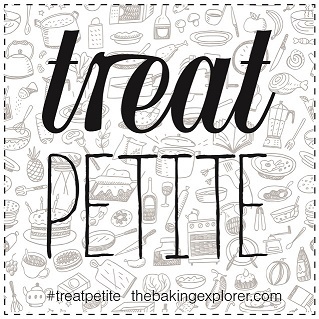 I am also linking up with The Baking Explorer for Treat Petite. What a fabulous idea. I have so many empty jars hanging around for those “just in case” moments, it would be nice to put them to good use. That chocolate spread sounds really good. I’m definitely not a fan of too much sugar and palm oil. I’ve heard about the We Want Plates site, but have never actually checked it out. I’ll do so right now. I am guilty of hoarding jars too choclette – so we may as well make delicious use of them!